Accellos, Inc., a leading provider of supply chain execution software solutions, today announced that it has made AccellosOne EDI for Microsoft Dynamics® GP and AccellosOne Collect for Microsoft Dynamics GP available in Data Resolutions’ enterprise cloud. This allows customers to run their ERP, EDI and barcoding solutions in a single cloud environment. AccellosOne EDI for Dynamics GP is a complete EDI solution for users of Microsoft Dynamics GP that supports all aspects of trading partner integration. Because it is a single, embedded database within the Dynamics GP Sales Order Processing (SOP) and Purchase Order Processing (POP) modules, customers of AccellosOne EDI for Dynamics GP often process EDI orders four times faster than they did with a non-integrated EDI solution and experience vast improvements in order accuracy. When using AccellosOne EDI for Dynamics GP, employees open Microsoft Dynamics GP with EDI orders already entered into the system, EDI acknowledgements or invoices already created and with exception orders flagged for review. Similar to the EDI product, AccellosOne Collect for Microsoft Dynamics GP was built and integrated specifically for companies running Microsoft Dynamics GP as a single, embedded system. AccellosOne Collect for Microsoft Dynamics GP enables companies with manufacturing and distribution needs to automate their manual warehouse processes, while providing the user with real-time information to keep track of inventory effectively. AccellosOne Collect for Microsoft Dynamics GP leverages radio frequency (RF) handhelds to automate the entire warehousing workflow, from the receipt of raw material, to picking, to lot and serial tracked goods, and everything in between. The EDI and barcoding solutions are available for sale through an extensive network of VARs who provide the software, hosting and support for a single subscription fee. More information about the solution or about becoming a reseller of this solution is available from Accellos in booth 904 at Convergence or from Data Resolutions in booth 2009 at Convergence. This year’s Convergence event takes place March 18-21 at the George R. Brown Convention Center in Houston, TX. 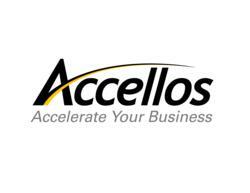 Accellos is a Silver Sponsor of the event. For more information on Microsoft Dynamics Convergence 2012, visit http://www.microsoft.com/dynamics/convergence/houston12/. For more information on Accellos’ EDI solutions, visit http://www.accellos.com/integratedEDISolutions. For more information on Accellos barcoding solutions, visit http://www.accellos.com/collect. Accellos is a global provider of software solutions specifically designed for the unique needs of logistics service providers and small and midsized businesses (SMB). Over 3,000 companies trust Accellos to be the technology backbone of their global supply chains. Accellos provides solutions for warehouse management systems (WMS), third party logistics (3PL), fleet management, transportation management systems (TMS), trading partner integration (EDI), automated barcode data collection, parcel shipping, transportation optimization and supply chain business intelligence. Accellos solutions are built on the AccellosOne platform, a modern technology platform featuring a user-friendly interface and simplified technical administration. For more information, email info (at) accellos.com or visit http://www.accellos.com. Data Resolution is a Microsoft Gold Partner based in southern California and has been providing a broad range of IT services to small and mid-size businesses nationally for over 10 years. Our main goal is to increase the customer’s business productivity by helping them realize their maximum benefit from their IT investment. We are a service company dedicated to long-term relationships with our customers. We aim to be known as the premiere IT provider. Unlike many hosting companies that just provide server space, Data Resolution specializes in providing hosting services related to all Microsoft products including Microsoft Dynamics. What does this mean for our customers? Our infrastructure is specifically designed to handle all of the complexities that go along with running ERP business grade systems. Since we have been deploying Microsoft Dynamics through a hosted model since 2002 we have continued to refine our infrastructure and approach to optimize performance and redundancy to ensure the customer’s data is safe and always accessible. All products are either registered trademarks or trademarks of their respective companies in the United States and/or other countries.